We really needed the day off. It’s quite draining being on the move consistently. After our short but relaxing hibernation the time came and we headed off into Tsetserleg, found an internet café and caught up on the mundane tasks that life in the western world requires – paying bills and responding to the plethora of correspondence that doesn’t just stop because you’ve temporarily stepped out! Lunch was enjoyed at a local café called the Cactus Bar where I’m sure the tourist priced menu was brought out and hit the spot temporarily. However, a session of harmonic burping in the vehicle once we’d departed suggested we’d either over indulged or that something was amiss!! Anyway the reflux subsided with no further symptoms (we’ll put it down to the food being a bit too oily?) 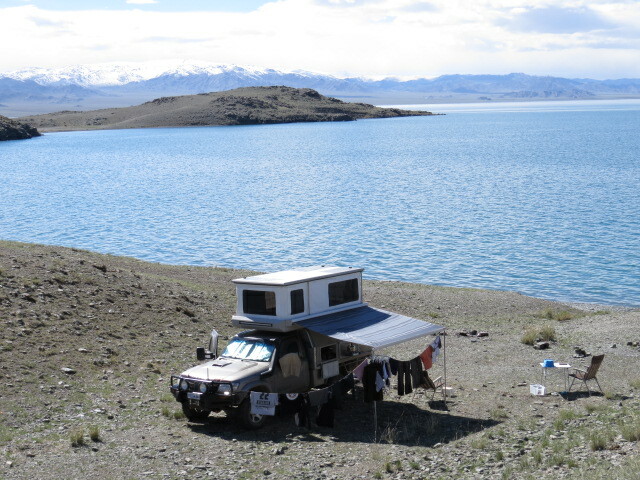 and we found ourselves leaving town through a very scenic pass quite late at around 4pm so finding a campsite was next on the agenda. The road proved excellent for a while and allowed us to get a some movement toward our next destination, which was the town of Tariat. As usual the sealed road ended abruptly, fortunately however the end coincided with ChuulutGorge which Jen had been reading about. 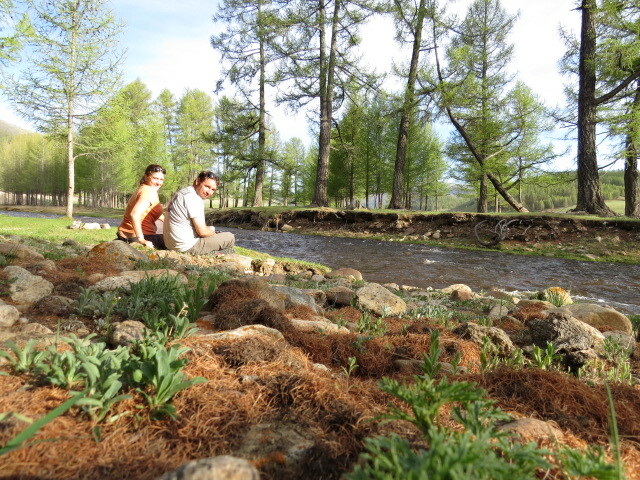 It was so picturesque and peaceful that we spent a little time just watching and enjoying the ambience before moving on. 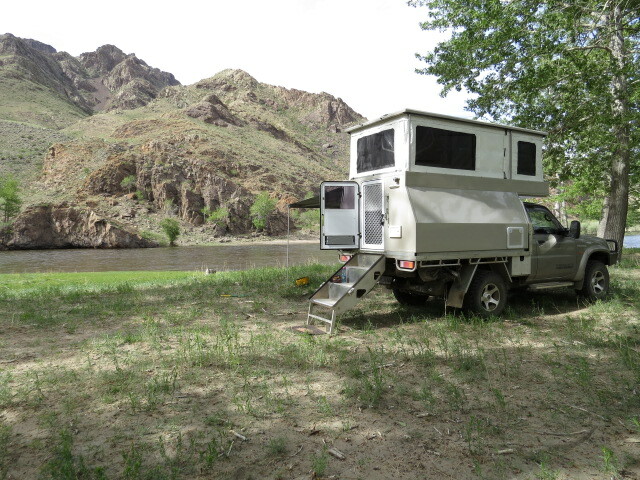 It was getting late and a campsite was now a priority but we were unable to find a suitable location along the gorge as it was all flat grassy table land with the gorge simply cutting a swathe through it and hence not lending itself to camping with that little bit of solitude. We ended up meandering along the track towards our destination and not 5 km from Tariat, managed to find a home for the night that again proved peaceful! Into Tariat and straight out again, it gets a little like that! Unless we need fuel or provisions we find ourselves generally transiting the towns enroute as they are all very similar. 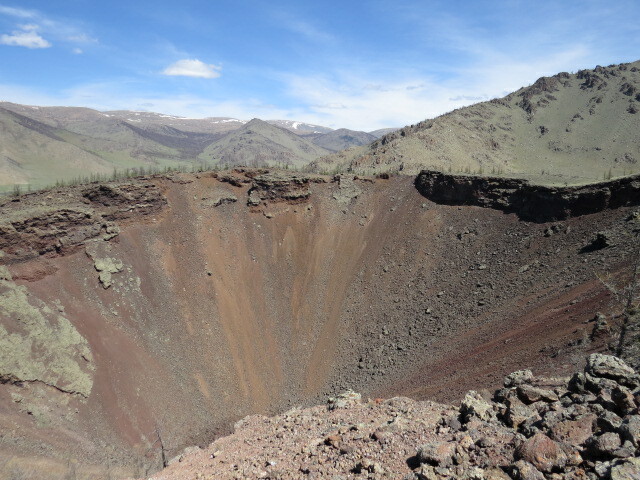 Just north of Tariat is the Khorgo Volcano, well worth a visit and we found it very interesting and enjoyable. The area has obviously suffered the effects of flowing lava and although it was no doubt millennia ago, the rock formations are obvious. 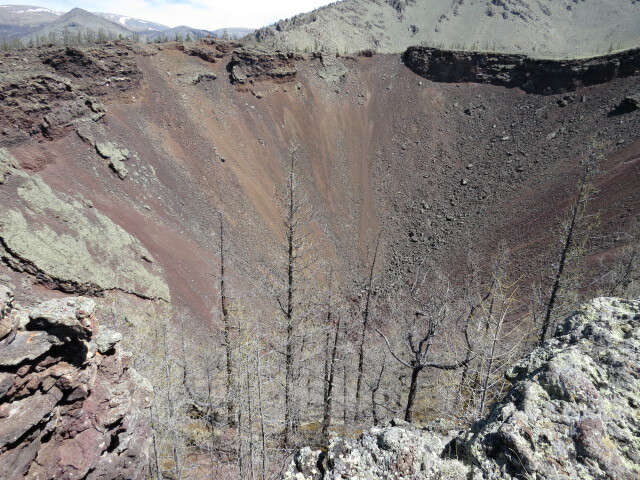 Large tracts of very distinct rock that was no doubt at one time glowing orange and steaming has spilled out all over the landscape in downhill directions from the crater of the Volcano and was very impressive. 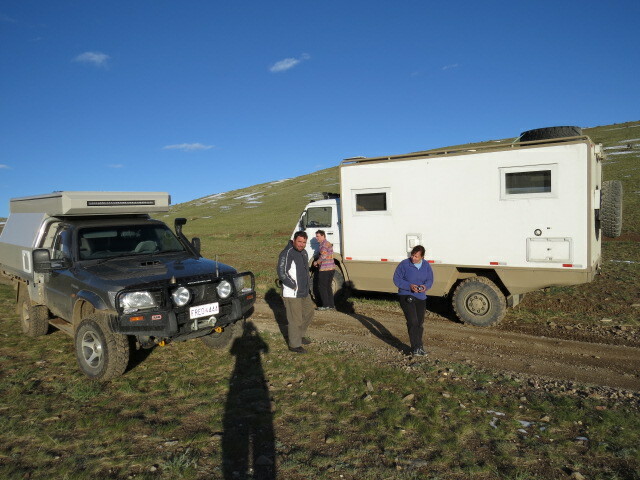 Whilst here we met a few other travellers, a couple backpacking with the usual garb of equipment that is associated with hard travel and a group of 4 Californians seeing the sights and being transported around the Mongolian steppe in a UAZ van! 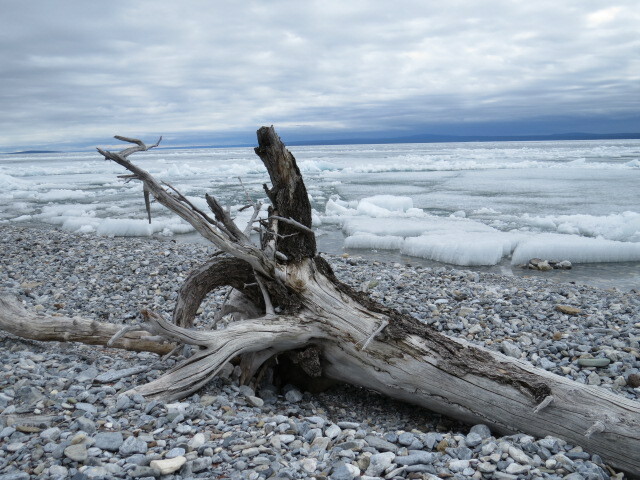 We headed off slowly in the direction of the Great White Lake which is only a few km’s from the volcano. A detour ensued, as we wanted to take in a couple of caves in the area! 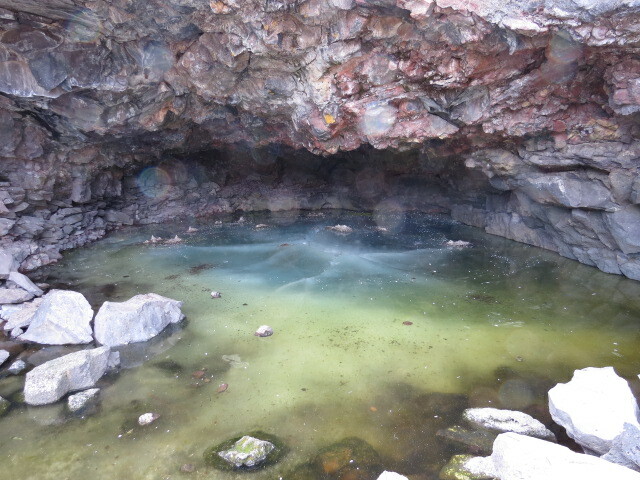 Yellow Dog Hell Cave along with Ice Cave. 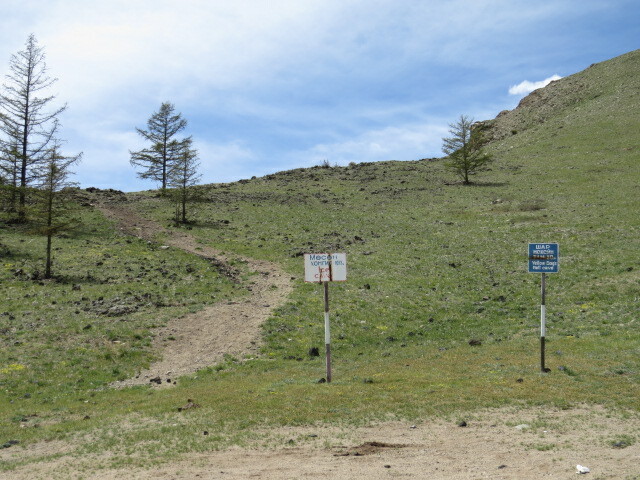 We idled around and found the usual Mongolian parking area with some signs and a walking track leading from the parking area up a slope. Off we headed up and over a small rise and into a basin all the while following previous traveller’s paths! After wandering around for some time with a mag lite and looking everywhere that was even half obvious we couldn’t locate anything remotely like a cave and began heading back to the Patrol. 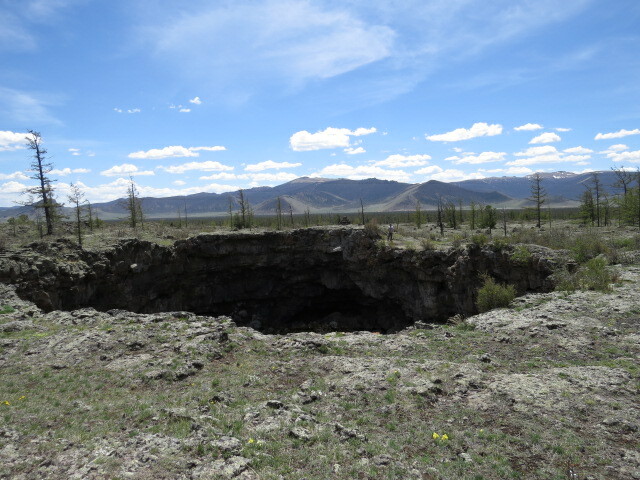 From a vantage point above the parking area, we noticed some sink holes in the opposite direction to both the signs and the walking trail that we had been on and thought –“couldn’t be – could it?” Yep it’s Mongolia, the caves proved to be in completely the opposite direction to the signs. I have to admit that at this point I wasn’t really surprised! 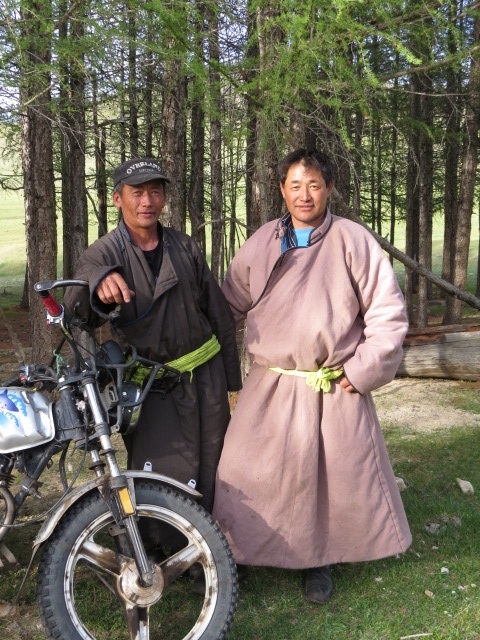 Mongolians don’t necessarily operate on the same wavelength that we find ourselves on! After wandering around for a while we set off toward the Lake where we intended camping. Whilst lovely and picturesque the lake wasn’t really a great location for us to camp, lots of tourist Gers and no trees for km after km pretty well sums it up. We stopped for a late lunch and put the billy on. Just as it boiled a Toyota Kluger came into view and proceeded to park right next to us. We were met with the statement – “We are International Sports People!”, to which we replied “We are Australians! 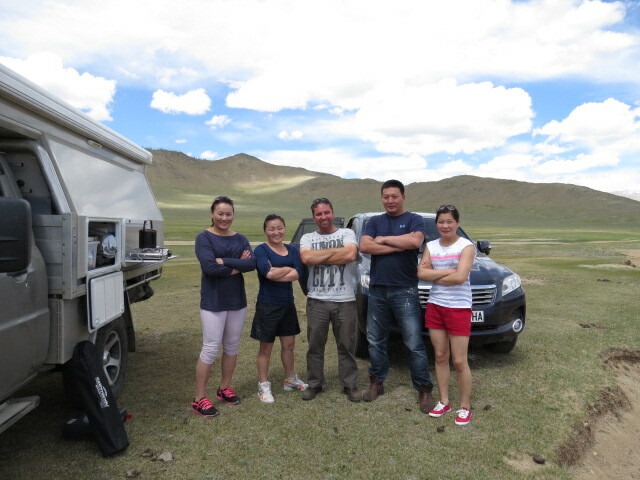 !” Turned out that the car was full of Mongolian Olympic Wrestlers! A little English from one of the team helped proceedings and we had another great interaction with the locals. The vehicle tour once again followed and we were rewarded with the gift of some smoked Omulfish, which was fantastic as we had as yet not seen any for sale! The Wrestlers were on a 9-day holiday from Ulaanbaatar and were spending their time seeing the sites of Mongolia also! No sooner had they departed than another local upon his horse arrived and settled in to watch the aliens and see what was to see. 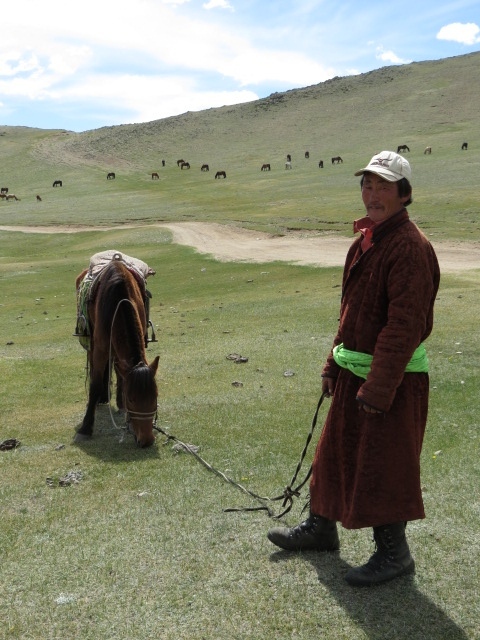 We spoilt him with Polaroid photo’s of both he and his horse and another Mongolian departed all smiles. We are getting good at this!!!! 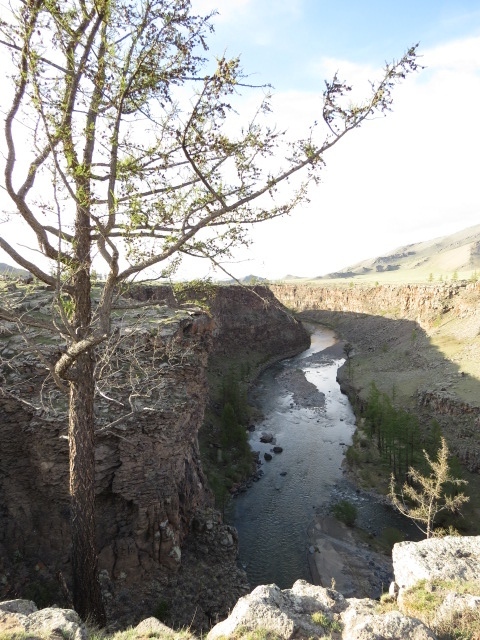 Jen took the helm and we headed north in the general direction of the town of Mörön and the gateway to Khovsgol Lake. The track proved to be one of the most scenic and enjoyable to date consisting of valleys that provided us with vista’s that drew your eye and delighted it with fantastic rolling hills intertwined with mountainous peaks with flecks of snow remaining from the winter. Low range was engaged for quite some time along this section with very steep passes and off camber descents with large and nasty ruts. The highlight in a couple of instances was transiting still frozen tracts of river with not a lot of indication of what may be below the ice should we break the crust! As usual the Patrol tends to come into its element in this type of situation and Jen handled it with a maestro’s touch! We meandered north along the valley for many kms, passing ger after ger, a site we are now familiar with. Eventually we found a lovely campsite along the stream that sits at the lowest ebb of this valley and settled in for a relaxing evening. We were only about 50m from the track and quite easily spotted by the locals but as we hadn’t seen a lot of activity we were comfortable with our choice. A couple of tasty beverages in hand and Jen armed with her bottle of Arkhi (Mongolian vodka), we wandered over to the creek and contemplated the plans ahead. Part way into our tasty treats and yep – a motorcycle and passenger arrived and we had the discussion in pidgeon Mongolian that we are now getting used too. The only tricky moment was when Jen needed to retreat to the Patrol to the retrieve the camera and our small globe of the world,(a departing gift from our Russian friends Vladimir and Nina), which has become integral in all conversations regarding our travels! She had a her litre bottle of vodka under her legs whilst seated and off course should it’s presence be revealed we would be obliged to enlist the locals help in relieving it of it’s contents. Don’t get me wrong – we don’t mind sharing but a litre of vodka isn’t going to end well! Anyway with moves akin to that of Houdini, I managed to slide the bottle into a new home beneath me whilst seated and no one was the wiser! Onward toward Moron and the topography kept up it’s performance as the valley we were travelling in remained lush and inviting. Late afternoon andwe began looking for a campsite. 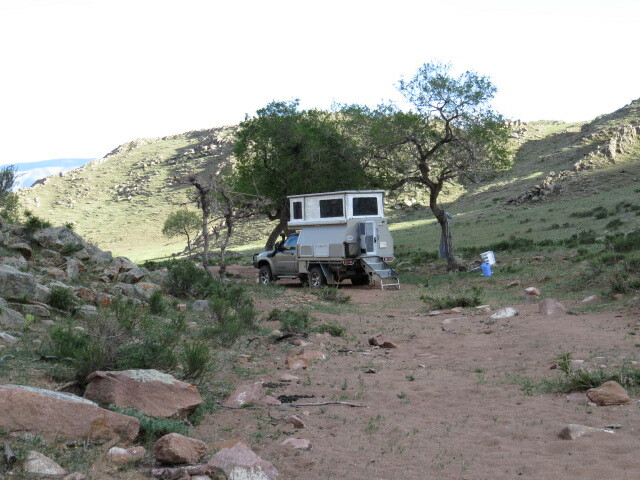 The previous nights home had been obvious but as is often the case when you need a camp it can be difficult. Cresting a small rise along the floor of the valley and a couple of tents came into view! Definitely not Mongolians and as we closed it became obvious we were about to encounter some tourists. 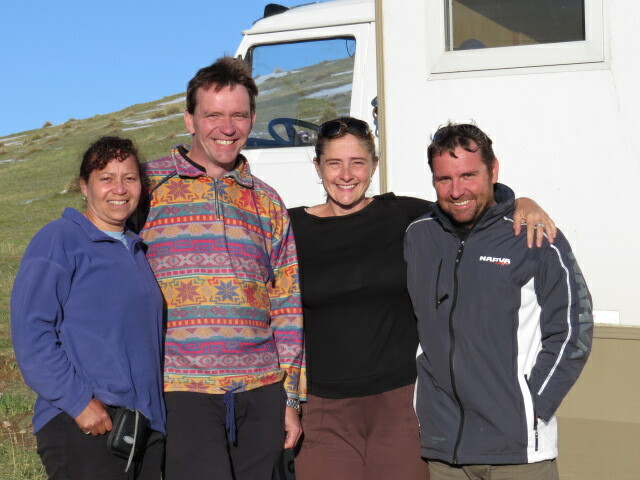 2 men and a woman from Switzerland push biking Mongolia! They were travelling in the same direction as us and after a quick chat we made off as camp was calling and the sun was licking the highest peaks, reminding us that it would soon be sunset! It was a few km’s before we found a lovely site amongst pine trees with the benefit of almost total seclusion. 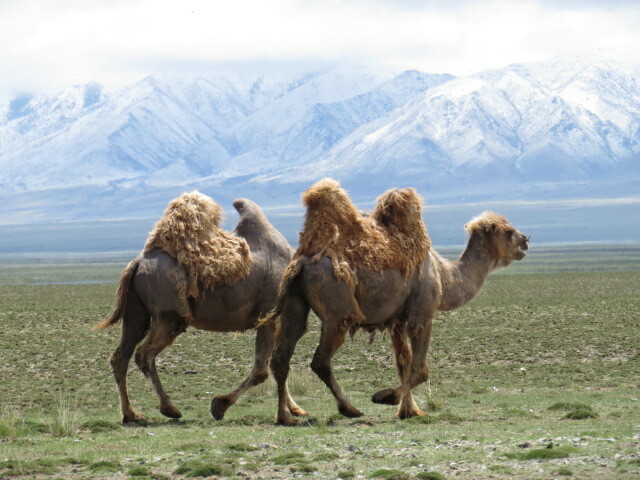 The following morning the track became quite corrugated rough gravel and Moron came into sight, giving off the same glow as nearly every Mongolian town. 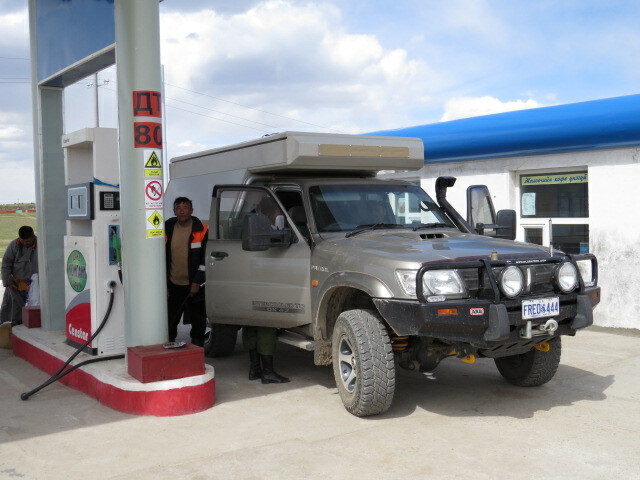 We just fuelled up and stocked up then made for Khovsgol Lake, 100km to the north. Sealed road all the way and upon arriving at the town that occupies the southern shore of Khovsgol we again had the early in the season feeling. Businesses are just beginning to ramp up, repairing and painting whilst erecting gers for the expected swarm of tourists over summer. 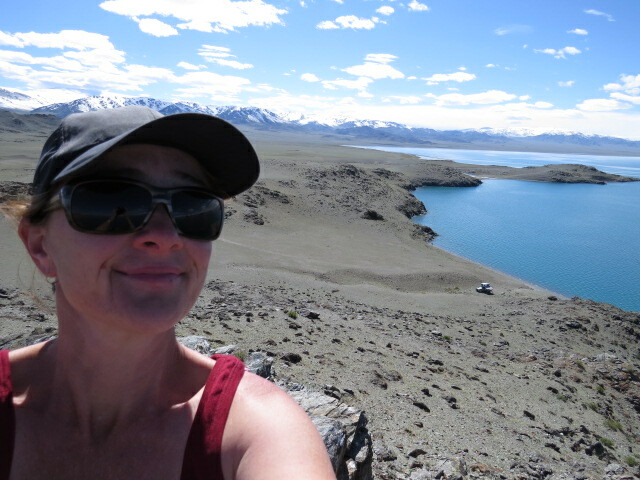 Remembering at this point that Mongolia is completely land locked so if water sports enter your psyche then a lake experience is what it will be! We made our way north along the western side of the lake over quite a high pass that provided good views of the completely frozen lake as we crested. We began our descent, surprised to see it completely frozen and were soon reminded that these massive fresh water lakes can determine their own weather – gloomy and very cold with a consistent icy breeze. 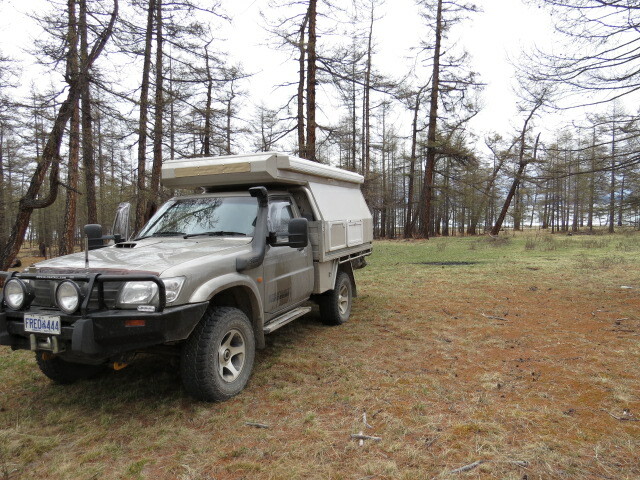 Around 40km up the lake along a gravelly but unmaintained track with puddles of water and the like but no real obstacles, we noticed a vehicle way in the distance along the lake side that looked out of place. Out with the binoculars and yep a Mongolian in what looked to be a Mitsubishi Challenger in all sorts of bother. We milled it over and thought we should offer some assistance, hence we meandered a few more km’s and came to a log cabin with a local requesting vehicle details to continue. You can head west from the lake into an area known as the Darkhad Depression, famous for containing lakes and local tribes that live with reindeer herds, using teepees instead of gers. The difficulty in reaching the area has kept them a little isolated and they have apparently managed to remain living in a reasonably traditional way despite interactions with some evangelicals whom have attempted to steer them in the direction they think we all need to move!! 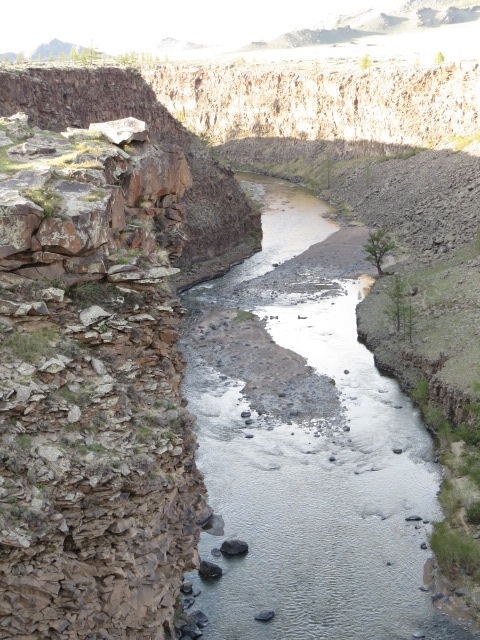 We had already decided that we wouldn’t travel via this area due to the amount of water around early in the season and the difficulty in locating these tribes as they move regularly. Just shy of the log cabin was the track the Mitsubishi had taken in an attempt to follow the lakeshore rather than take the western and more inland track. One look at the track and I decided that I didn’t really have an appetite for helping with a recovery – if your dumb enough to proceed on the track they were attempting without a well setup vehicle then maybe a nice cold night in the car will make you think twice next time! We meandered back south a few km’s and found a reasonable camp amongst the pine but visible from the track. 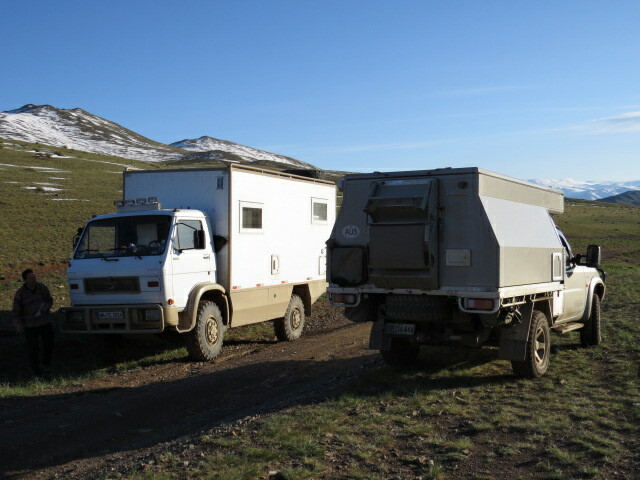 There are a lot of tourist ger camps along the track and it was difficult to find anything inspiring. All set up and drinks in hand we wandered along the lovely but cold shoreline and made new plans, we’d intended to spend a few days here but both decided that moving on tomorrow would be a better use of our time. 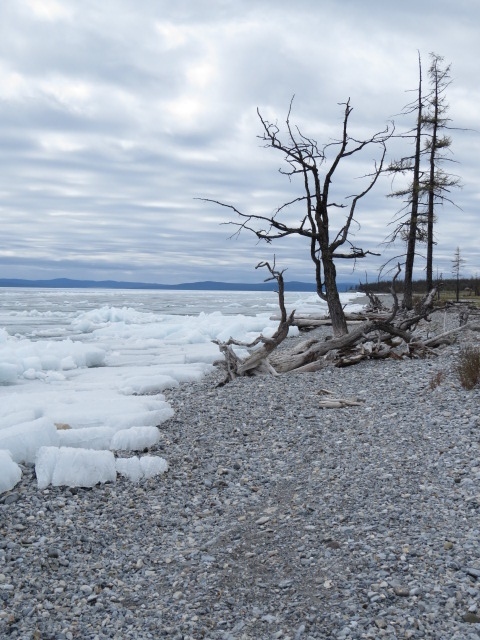 We had really enjoyed Lake Baikal in Russia and Khovsgol wasn’t quite meeting our expectations. Remembering however that the lake is 150km long and I have no doubt that there are magnificent locations along its shores if you were to persevere. Once the blue sky arrives and the locals are in their ski boats it’ll be paradise!! Back in the camper and the temperature dropping with the sun, a motorbike spots us and picks it’s way through the scrub to our locale – a quick lap of our vehicle and he pulls up at the back door and starts beeping his horn, of course we already know he is probably looking for someone to recover the Mitsubishi. Door open and Hello! He promptly points to the Patrol and then the wheels and with hand signals demonstrates spinning tyres and being bogged! Obviously an attempt to procure our assistance! Jen points to our tyres and communicateswith the assistance of a thumbs up that we are fine, not bogged or remotely stuck but thanks for you concern!! Eventually he gives up and with a big smile rides off. A couple of hours later and about 6 motorbikes head past us toward the bogged vehicle along with a UAZ 4×4 sometime later! Pleased to be left to our own devices we relaxed and wasted the evening. 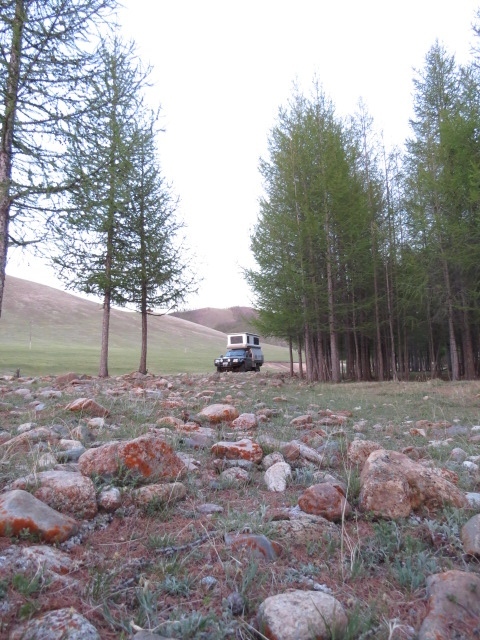 The following morning and the Mitsubishi, UAZ and motorbikes had not yet returned. I was feeling quite happy to have dodged that situation. 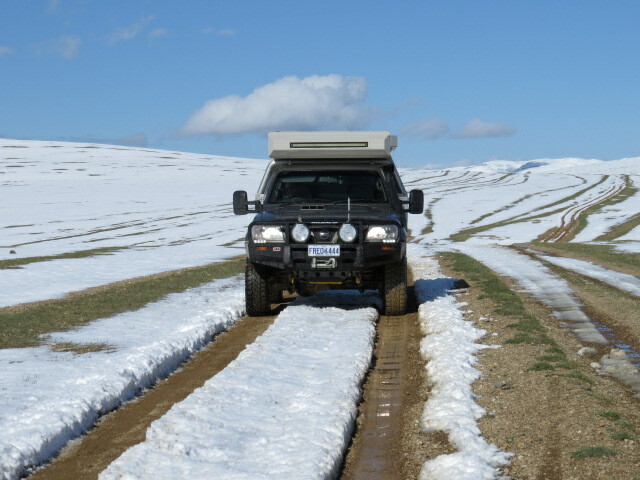 A few km’s after our departure a Patrol with a winch came the other way – hmmm wonder where he is going!! 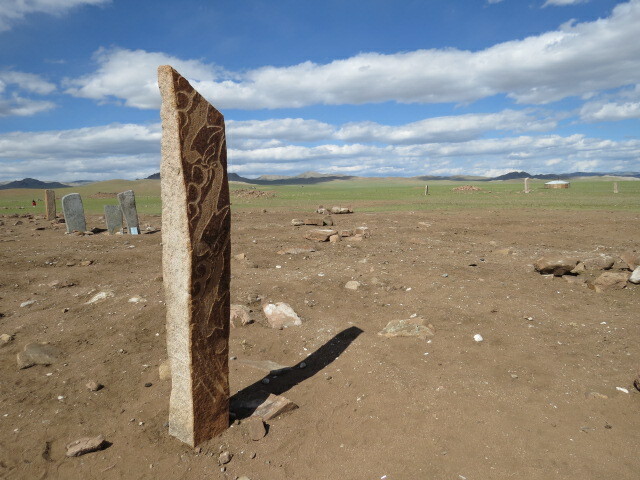 We returned to Moron and then 20km’s west to the site of some deer stones. 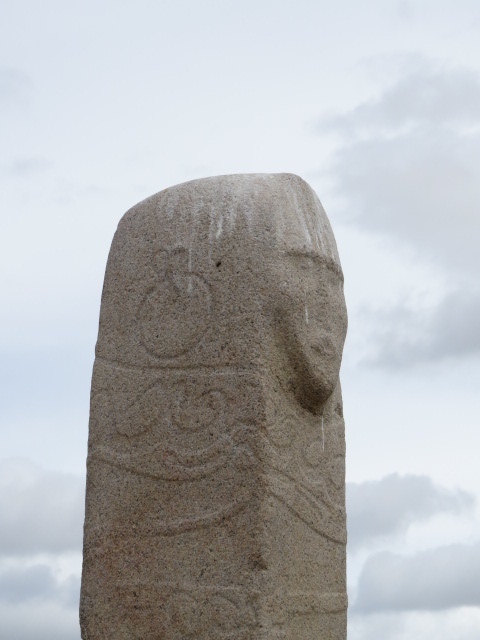 Large carved stones around 3500 to 4000 years old placed as burial markers. 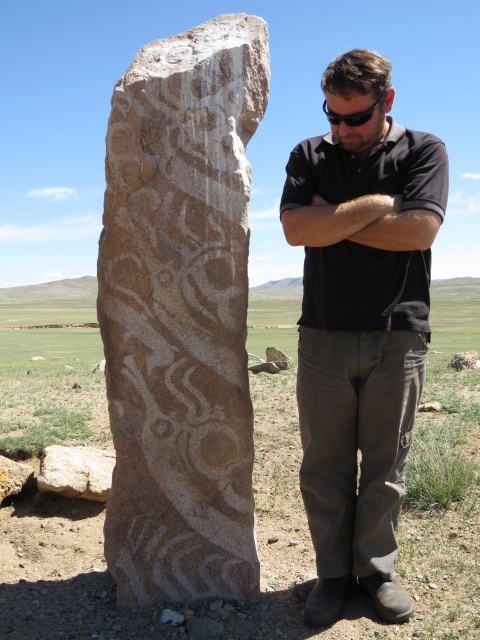 It was really interesting and worth the detour but soured a little when 2 Mongolian family’s arrived and spent a couple of hours climbing on them and generally showing no respect at all for their own heritage. 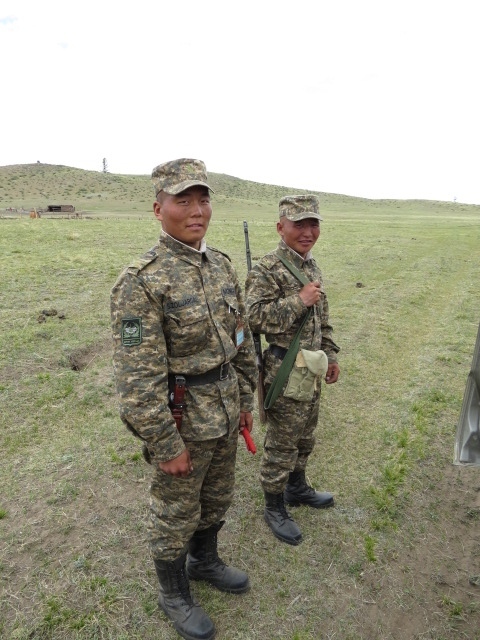 There is a ranger station there but as we’ve learnt in Mongolia, until the crowds are large enough during the on season and they can pocket enough money they don’t bother manning or in this case protecting the sites. We made off before we’d really spent enough time there but couldn’t stand the lack of respect any longer and found an awesome campsite high up a valley a few km farther west, an early camp enjoying a spectacular vista was the order. We continued west the next day hoping to cross a rather large river paralleling the track as we really needed to be on a track further south in order to see the sites we had marked. I had reservations about being able to cross the river so we pushed on to around 40km where a town was marked south of the river and maybe a bridge. Alas there was no bridge and the river remained its 50m wide quite deep and fast flowing obstacle. We could continue west but decided to head back to Moron and pick up the track we wanted to be on. This also allowed us a second visit to the deer stones without the vandals along with a small resupply in town and top up with diesel. Continuing west on the opposite side of the river and with some good fortune,we managed to find a great campsite along the river completely out of sight of the track. 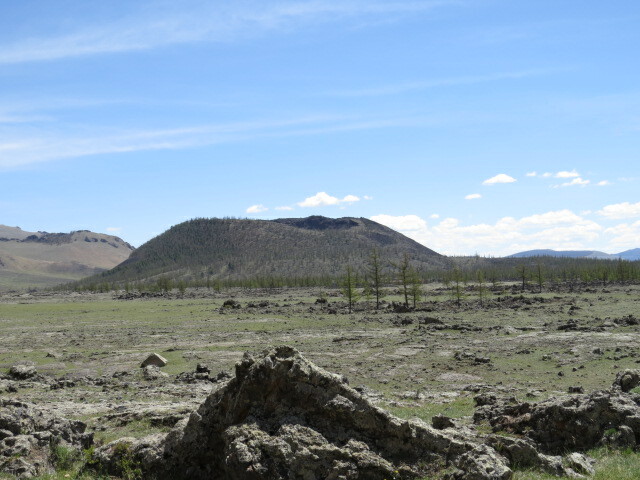 We also had firewood within reach (rare in Mongolia) and had our first campfire for the journey! 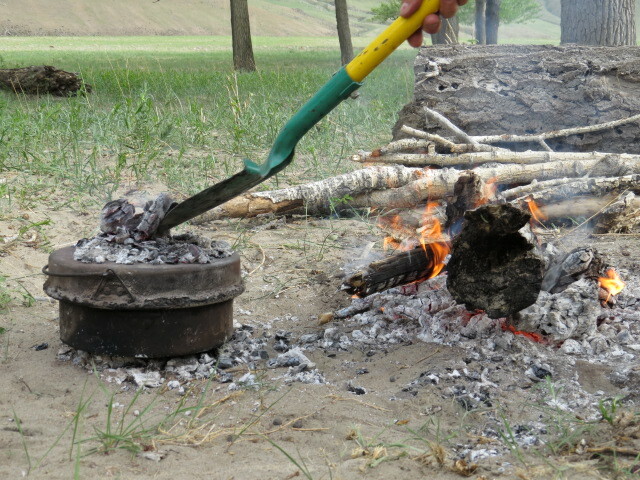 It was more than well received, the flames invited the camp oven and so a stew was promptly prepared. Enough coals procured and lovely meal presented itself a couple of hours later. 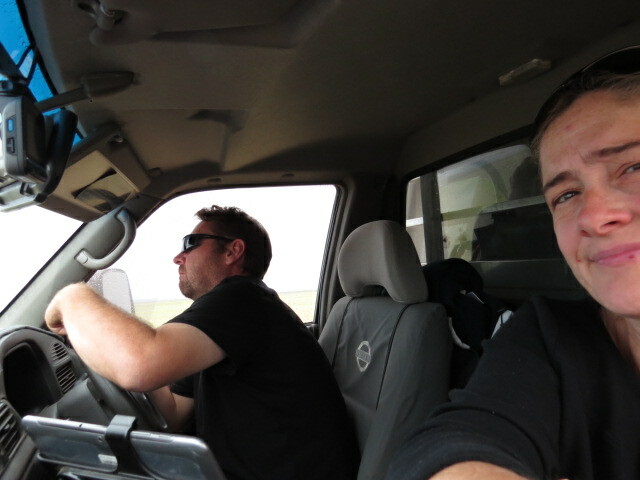 Back behind the wheel the following day and the usual 20 to 40km/h stretch of highway (track) as we continued toward our inevitable exit from Mongolia. Whilst you probably can smash along at 60km/h like the Mongolians do, we find we are limited to the slower speeds as we have a concept of what is happening under the vehicle and how important it is to us to maintain it’s integrity.Not to mention that every time you get a head of steam up and take your eyes off the track for a second you collide with some form of bone jarring obstacle. So often we are passed by motorcycles that will make a few km’s on us and then stop, sit in our massive ploom of dust as we pass only to – yep you guessed it, pass us again and again and again! This practice is certainly not limited to motorcycles but seems to be a favorite amongst most forms of transport. At one stage we’d been passed a couple of times by a tired Hyundai sedan of some sort and as he was approaching for his next overtaking maneuver, we had a UAZ van coming towards us. Now there are 10 tracks all in parallel and it’s dead flat with nothing to impede your view. Yet the UAZ was, as is also generally the case, barreling along the same track that we were and on and to our right of the myriad of options. Technically he should move over to his right but they do resist this action at every opportunity. As has become practice for us we just pulled off the track and stopped hence allowing the oncoming vehicle to pass unhindered. With the Hyundai and UAZ now head to head on the same track they all but had a head-oncollision, albeit at probably 40km/h as neither would give for the other – Mongolia!! Continuing west through the odd ramshackle town site, we found we were slowly drifting south away from the most northern track shown on our maps, a course correction would be required at some stage. 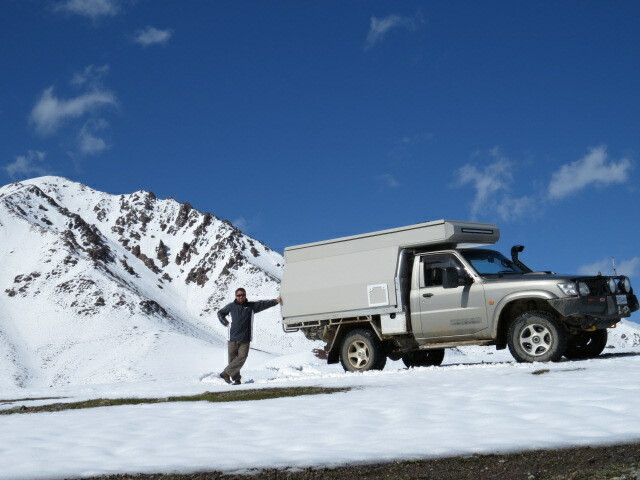 We were ultimately heading for the town of Ulaangom and needed to get to the northern side of a large mountain range in order to access the town without more than the usual Mongolian detour. 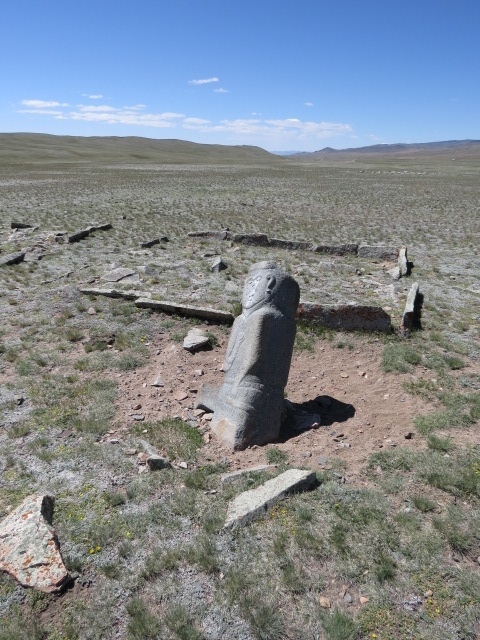 Just before the town of Zuunhangay we came across some Turkic burial stones, similar to the deer stones but much younger at around 1500 years. These stones are very nicely carved with great representations of warriors including belts and knives along with bow’s and arrows! It was fortunate that we’d been more south than our planned route or we’d have missed these historical relics. Once arriving in Zuunhangay, a track north came into view and that is the way we went! A reasonable camp was found amongst some pine trees and we again relaxed the evening away. I think we will stop!! Anyway they were very friendly and after a brief discussion and finger pointing on the map we were allowed to continue north and pick up our desired path west. According to the map the Russian border swings north so we are only close to it for a few kms, but we really don’t know the rules as the language barrier is ever constant. 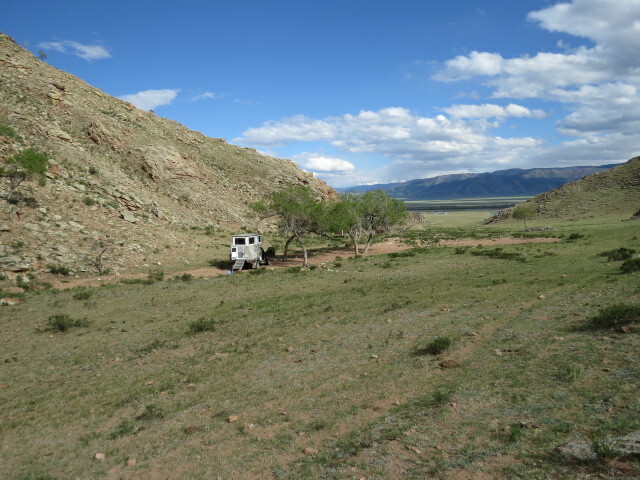 Now on the northern most route across this great country we found ourselves having dejavu as the terrain north of the range was dead flat and quite monotonous. The wind was howling and the terrain was a dust bowl and with our slow speed our own dust was overtaking us! This went on hour after hour! We arrived in the town of Baruunturuun and decided to take on some fuel and alongside the bowser and a crowd appeared. The tour of the Patrol and camper began and once again, out came the polaroid camera. Photo’s taken and dispersed amongst the crowd, we left to waves and smiles! A campsite solution was becoming an issue and we really wanted some shelter from the winds, but it wasn’t until around 9pm that an option presented, a few km’s off the track we managed to huddle amongst some sand dunes which was more than welcome compared with the flat inhospitable plains. 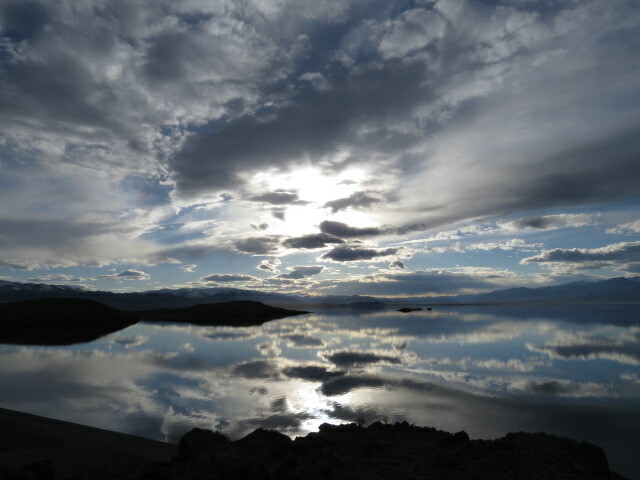 The clouds slid overhead as the sun departed and would you believe the rain began around 3am and didn’t stop! 150km of muddy track now became the norm, dust bowl one day – sloppy the next. Fortunately, although the rain was reasonably heavy and unrelenting the track was generally only wet to a depth of a few inches and looked worse than it was. 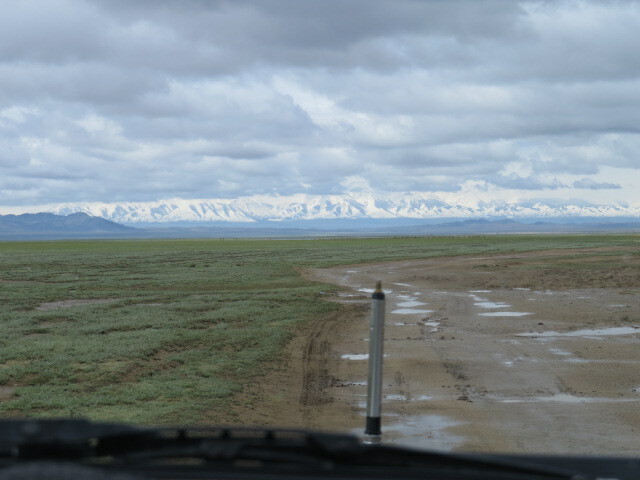 So we arrived in Ulaangom without incident but with a very dirty and filthy Patrol! The town is bordered to the west by some large mountains, which we’d been able to see for most of the previous dusty driving day, and they were now covered in snow! We had been lucky and missed the worst of the weather! An unispiring town saw us struggle to find some provisions, task completed and tanks topped up we headed for UuregNuur Lake which would require us to head over the UlaanDavaa pass, although quite low at 1975m and only 500m above the town it was straight up into the snowline. After the initial pass we realised just how much snow had fallen, a good 200 to 300mm and what looked to be a much heavier dump on the peaks. We enjoyed some fantastic scenery whilst transiting now snow covered valleys and passes. I’ve not had much experience with driving in snow but the next few km’s relieved me of that! 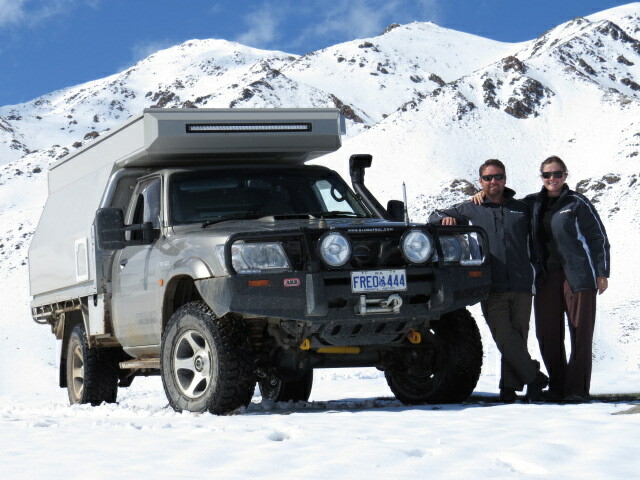 On our final descent toward the lake and just below the snowline we came head to head with an M-A-N 4×4 truck with a camper conversion! We piled out, excited to meet some like-minded people and the bonus was that we finally had an opportunity to speak our native tongue! It had been a while since having a fluent conversation other than with each other…. Sleet, hail and snow had been the introduction to Mongolia for these travellers whom had been amongst the weather we’d been fortunate to avoid. They had crossed from Russia the day before. Into the motorhome and the kettle was on, Paula from England (schooled in Melbourne!) 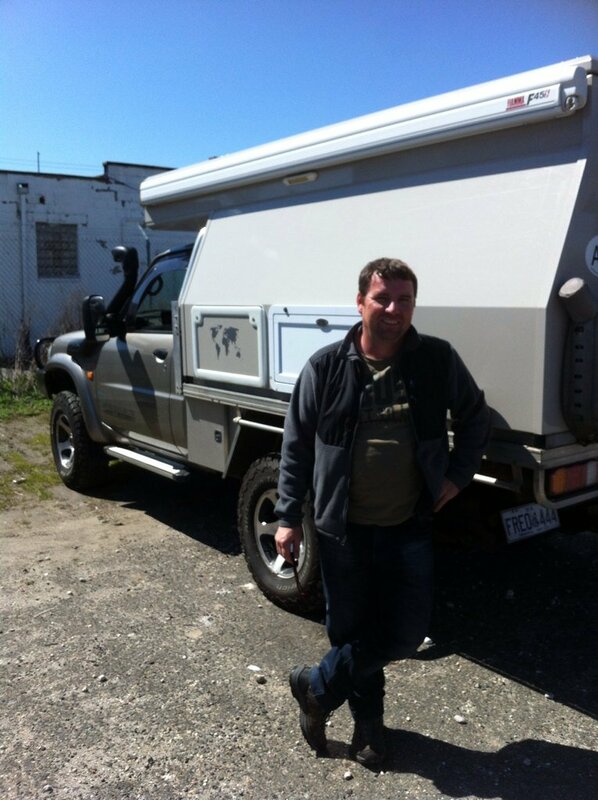 and Guido from Germany, married and living in the west of France are on there way to China, Laos, Thailand and Malaysia before parking up and flying to Melbourne in order for Paula to enjoy a school reunion! 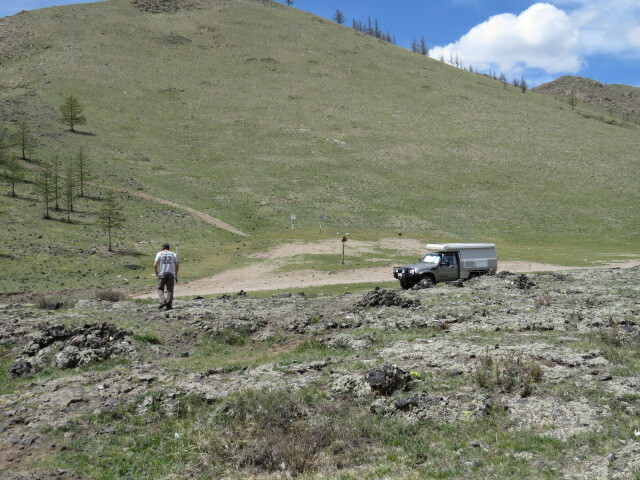 Pointers and campsites discussed in both directions and nearly 3 hours had passed since our impromptu meeting. Goodbye’s said and we departed in opposite directions, if it works we’ll meet them in France as they may be home around November! We descended for another 20minutes and the lake came into view, dusk was taking hold as we came within reach of the lake. A beautiful basin of water surrounded by a 360 degree rim of snow covered peaks. With another dose of luck, we managed to pick a location that looked as if a camp may present itself and found ourselves in probably the best campsite around the lake! I began dinner as darkness descended (10pm)and yep a motorcycle promptly parked next to us and we had our first visitor. We really weren’t in the mood but what can you do! Jen took the lead and began entertaining our visitor whilst I continued cooking, the only mistake she made was opening the camper door! He shot up the steps and parked himself on one of our seats like a ferret up a drain pipe! Those traditional Mongolian full length colourful jackets they love to get around in might look cool but they STINK, I’m trying to cook and hide the vodka whilst Jen is trying to coax him from his now cosy perch. “Get him out, Get him out, Get him out” was all I could say at this point!! We managed to extricate him and after a short time and he departed all smiles, visiting us again the following day with the usual request for a cigarette?? Some washing and relaxation was in order – now settling in for our third night in this stunning location as I smash away at the keyboard and yet another visitor began beeping his horn. I found him rather comical, the local gentleman suggested that we should pick up our rubbish and not spread it around! Our reaction was “excuse me!!! 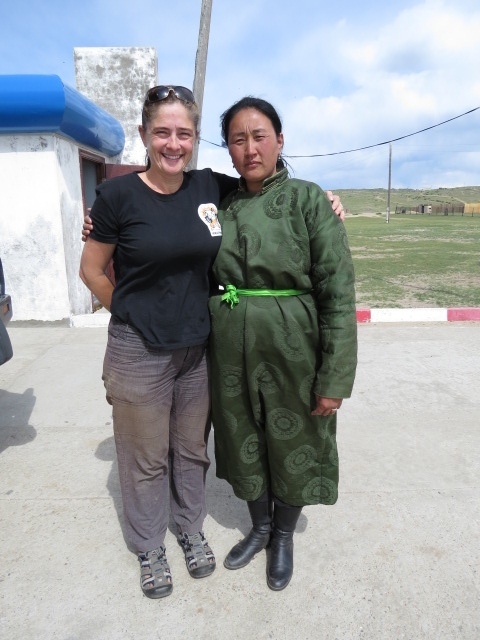 !” We showed him our bin bag below the camper and suggested that the Mongolian pigs that can’t take their rubbish with them might be better fodder for that suggestion! 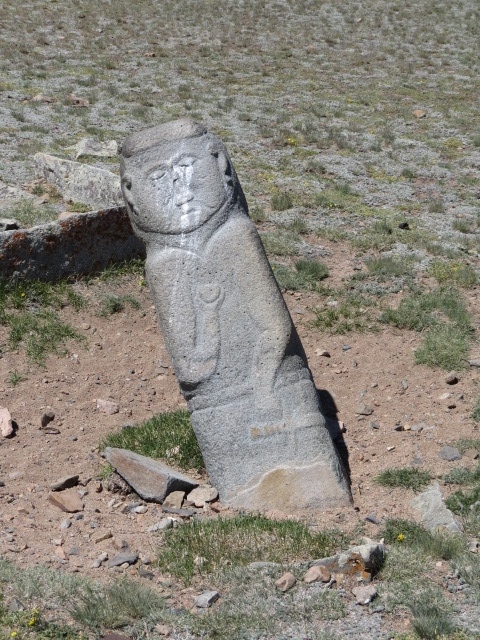 This entry was posted in general, Mongolia on June 10, 2014 by Jen. Awesome pictures, great stories, cant wait until the next installment! 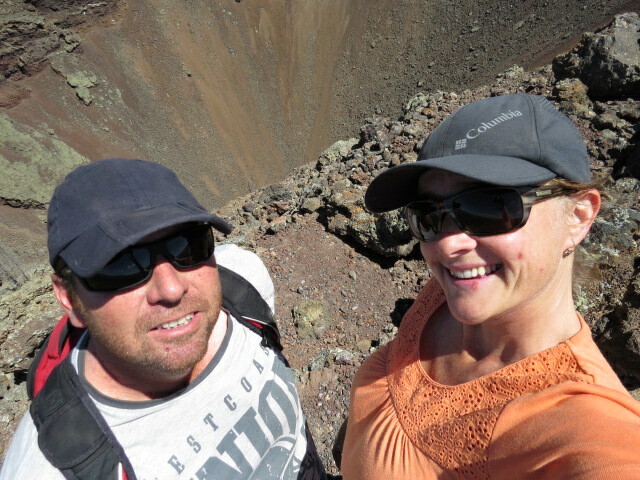 Great volcano selfie Jen and Justin !! Keep up the photo montage quite entertaining its starting to look like you’ve been employed by the Mongolian Tourist Bureau. Even though I have no idea where you are half the time I see you both as the Mongolian version of Lara bingle -‘ where the bloody hell are ya?’ Just don’t get Justin in a bikini please my eyes couldn’t handle it!